What Is Confessions Of A DisNerd? Other Places To Find Us! 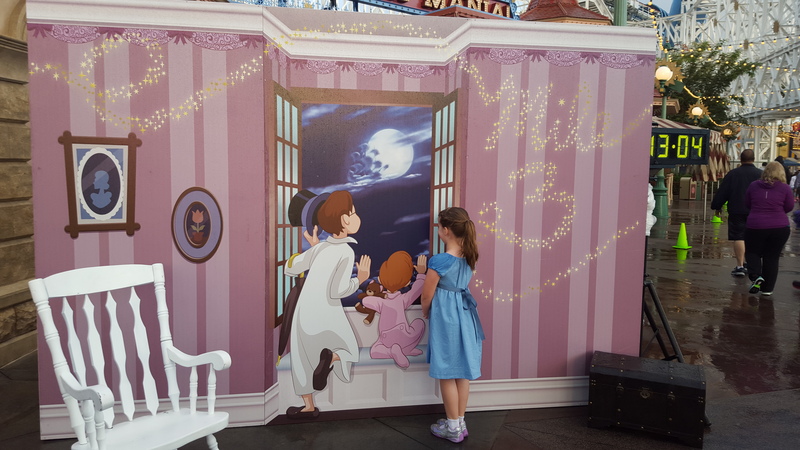 Note: This is the third (and last… for now…) part of a series about my experience being a first time runner attending my first RunDisney event. I hope you’ve enjoyed, and if you have yet to read them, click to read part one and part two. Apparently, the answer was us. We were that kind of crazy people, along with roughly 4500 other crazies. However, any feeling of being tired was forgotten as we walked through Disneyland’s front gates with race bibs securely fastened to the front of our shirts. 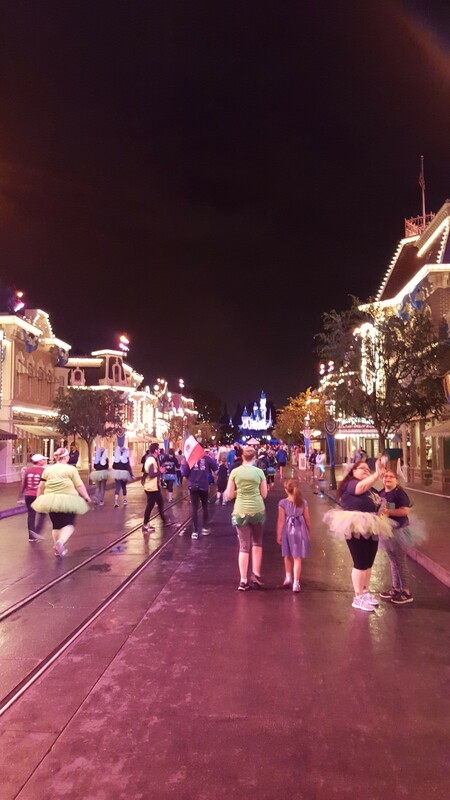 4:30 AM, and Main Street was alive with music and lights as runners made their way to the starting corrals. …. We were off! At least, kind of… You see, with over 4,000 people taking off from the starting line, even one corral at a time, it definitely takes a few minutes to get moving. However, once we were moving, I knew there would be no stopping – at least not until we saw characters on the run trail or other photo ops! I have to say, the folks at RunDisney really know how to make a run, even a simple 5k, a fun and inspiring event. As we began the run, The path was lined with cast members clapping and cheering us all on as we set out on our journey. They continued to cheer us on wherever they happened to be stationed that morning. Mechanics working on ride vehicles backstage, people from their office windows in the TDA building, security guards working the Cast member entrance… they were all enthusiastic and friendly! 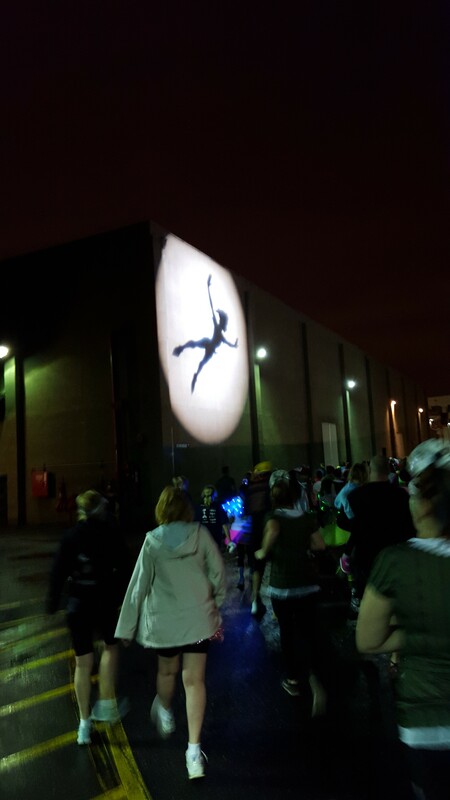 We were also told to keep an eye out for Peter Pan’s shadow, and to give our best Peter “crow” whenever we saw it. This led to some quite enthusiastic yelling and screaming in the hour before dawn. I’d also like to add, the running crowd was quite fun as well. Lots of green tutus and wings, costumes (The DisNerd Family ran as peter, Tink and Wendy), and themed teams as well. I wish I had more pictures to share of some of the runners, but being that we were involved in a run, we had to keep going! This included when the rain started coming down somewhere around Mile 1. Fortunately, although it was a steady, constant rain, it was not a torrential downfall either – just enough to get us wet and make many of us cold! Even with a cloudy sky, Peter’s shadow could still be found! I’ll be honest and say, as much as I worried about the amount of running I could actually pull off, I found myself wanting to run more! There were points where the path narrowed, and you could only move as fast as those in front of you. Also, with mile markers and characters out, stops were sure to happen. I mean, who could resist stopping to take advantage of this picture opportunity with a little running Wendy? I did keep my promise to myself though. I started running (Once I was in a clear enough space to do so), and I finished running. Do I plan on doing more running in the future? You bet. I may never make it to a half marathon, or even 10k, but this event has inspired me to even start looking at local 5k events here in Arizona to see what else there may be to do! Speaking of 10k and half marathons, my hat goes off to all runners in any running event, RunDisney or otherwise! You have my repsect. As do you, dear readers. I appreciate all of your encouragement and well wishes. I felt your support as I ran, and was even encouraged by a couple readers (and old high school friends who happened to be running other events that weekend) who happened to be there and cheered me on as I passed! 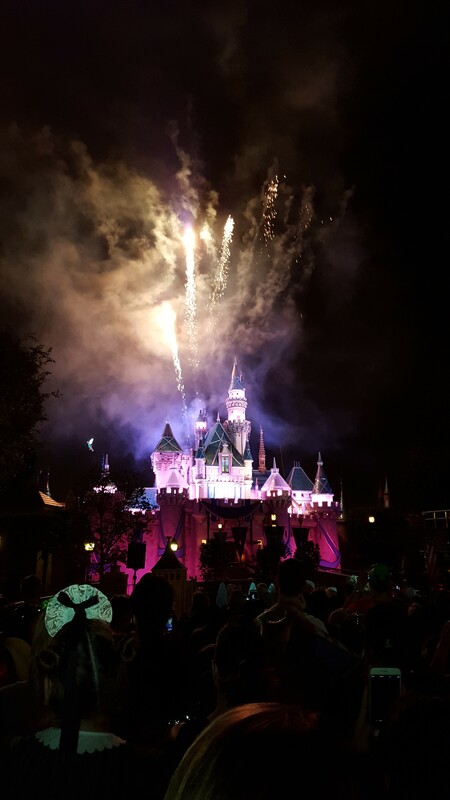 It was truly a memorable event, and one I would recommend to anyone, especially fans of Disney, regardless of whether it’s your first or 51st running event. Disney magic, and getting in shape? What can be better?!? 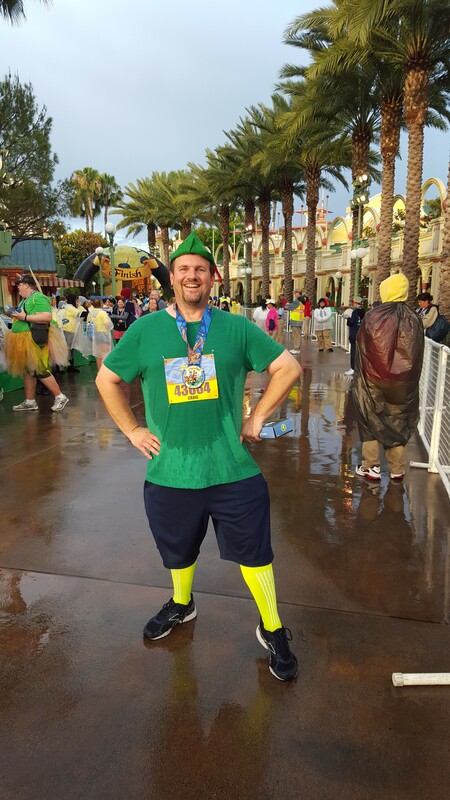 You bet I look like a bit of a dork… but this DisNerd finished his first 5k, even in the rain! It’s something I’ll always remember, and will always feel the support I received from my friends and readers! A Running DisNerd, Part Two: A Walking DisNerd? This is part two of a series – A Running DisNerd, in which I discuss my desire to prep and run in a RunDisney event. 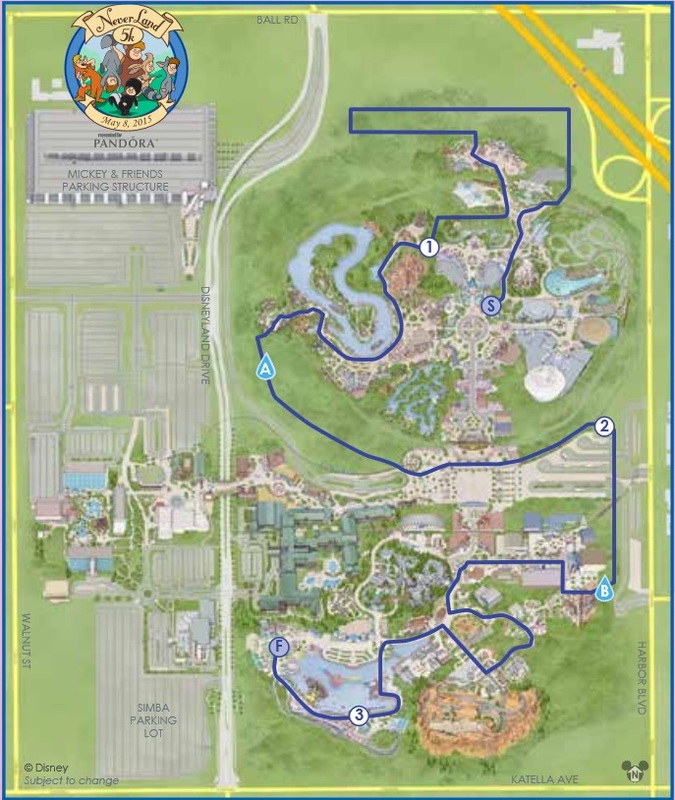 In this case, it’s the Never Land 5k, in conjunction with the Tinker Bell Half Marathon Weekend. Being my first 5k of any kind, I’m going in not really knowing what to expect, but sharing with you, friends and fellow DisNerds, as I go. You can read A Running DisNerd, Part 1: I Don’t Run, here. Well, the past month has crept on me, and I still feel as though preparations have not gone as well as planned. Now, this isn’t to say I’m not doing the Never Land 5K. I promise you, I will be there on Friday, May 8th, and I will give it my all. I don’t give up. But, I may be walking a bit more than running. But I’m actually okay with this. You see, this is my first running event anywhere. It’s a push to a personal realization that I do need to be in much better shape than what I currently am. I’m using this realization to keep me going forward and doing this 5k, even if I’m going to do a portion of it walking. Because it beats sitting still. And what better way to do this than with the aid of Disney? I’ve already been supported by friends and fellow DisNerds – your words of encouragement have definitely inspired me! I have also talked to others who have run in these RunDisney races, and have heard that, for a starter, there’s no better race to run for support and fun. I’m definitely approaching with the fun factor in mind, as is the rest of my family. In fact, the Little DisNerd (7 years old), the dancer in the family, has informed us that she plans on sashaying through the entire run, unless she sees Peter or Wendy, because, you know, Peter and Wendy. Speaking of, we’ll also be doing a little bit of dressing up. What’s the fun of running a Never Land 5k if you’re not being part of Never Land in the process? 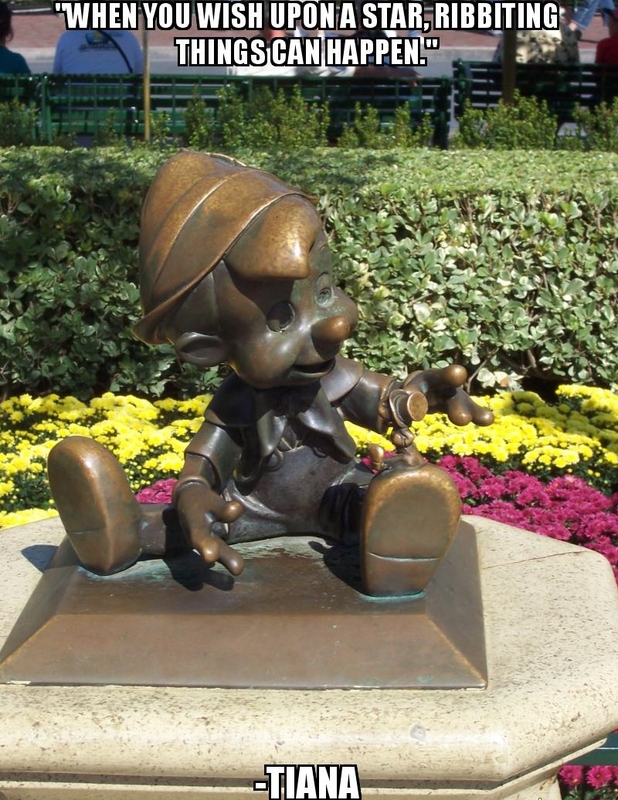 I’m definitely focusing on the fun – I’m running through Disneyland and Disney California Adventure, so that will help! I will finish the race. If nothing else, I plan on starting by running and crossing the finish line running. There aren’t many opportunities to run through Disneyland without security asking you to walk safely, so we might as well take advantage of the opportunity! If I walk more than run, so be it. I will still be taking those first steps to getting in better shape, and enjoying the magic of Disney in the process! 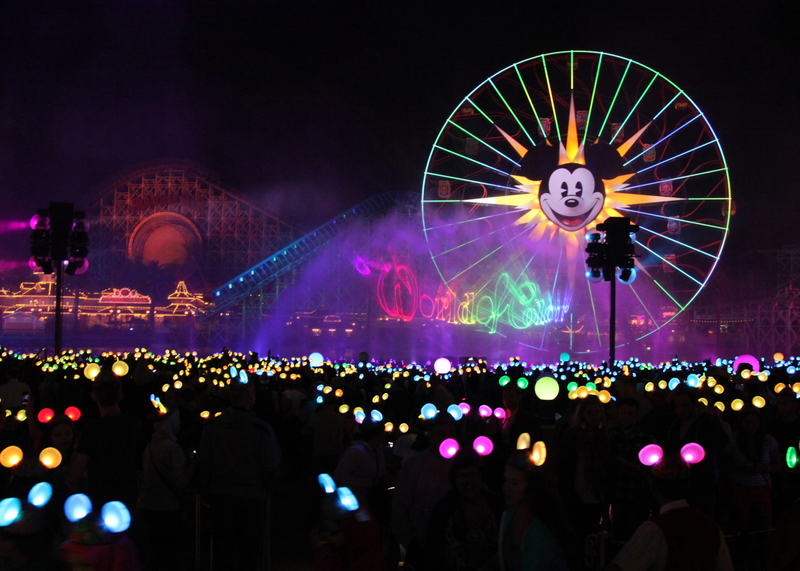 If you’re going to run, why not run through the Happiest Place on Earth? I’m just a few days away, friends. I appreciate the well wishes and support. Over the weekend, I plan on posting and sharing pictures of not only the 5k experience, but of the parks and goings on as well. Make sure you’re “liking” Confessions on Facebook, as well as following on Twitter and Instagram. You never know where something may show up! Once I’ve returned, I’ll be blogging my views on the entire RunDisney experience – I look forward to sharing more with you! In “Why Tomorrowland Matters, Part One,” I talked about the early hype and speculation I had for the upcoming Tomorrowland movie. Yet, in doing so, I realized I never discussed WHY both the movie, the theme park land, and the idea of Tomorrowland as a real place matter to me, and should (in my opinion) to others as well. I hope the words that follow make sense, as it’s a reason very near and dear to my heart. It’s also one of the reasons Walt Disney was such a fascinating man to me. We live in a cynical world. And it’s understandable why we do. I mean, look at the news. As I write this, people in Nepal are recovering from a devastating earthquake. Clashes, riots, and terrorism are constantly main headlines for news outlets. Now, natural disasters, wars, civil unrest, and social injustices are nothing new. I know looking back even thousands of years, we can see evidence of these things happening. But at the same time, with advancements in technology and humanity, can we say this is the future Walt Disney envisioned when he built Tomorrowland in Disneyland? I don’t think anyone would argue the answer to that one. The Tomorrowland of 1955 is not where we are at today. Yet, that vision is what we need. As many have noted, Walt was an optimist, or as Ray Bradbury preferred to call him, an “optimal behaviorist.” Every day, he was pressing forward, trying to be the best he could be, looking for new ways to do things, always looking to make better what had already been done. And better it he did. The development of the multiplane camera gave animation depth. An amusement park laid out through a central hub with themed lands in every direction gave birth to the theme park. 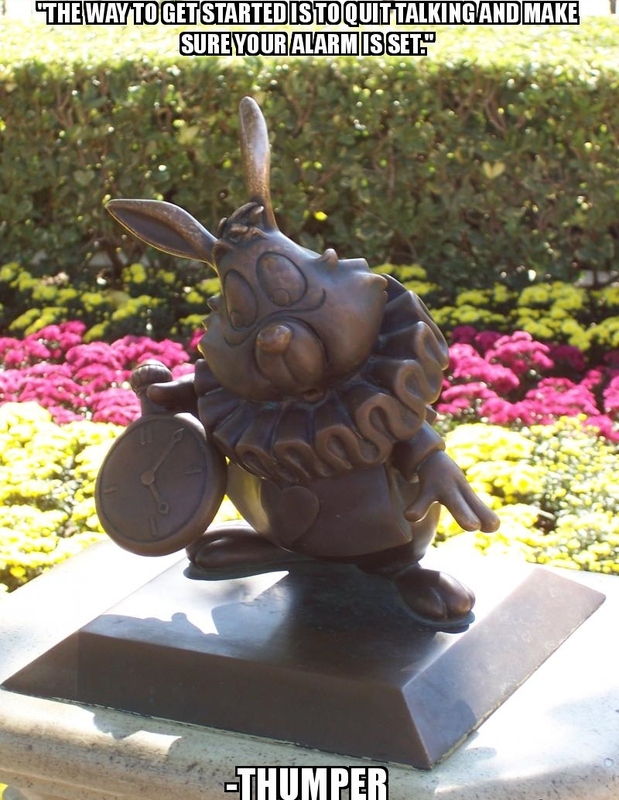 A desire to make attractions more interactive and lifelike gave rise to Audio-Animatronics. Walt believed in looking forward, in using this technology for the greater good. I often stop and wonder what might have become of EPCOT, had Walt been given even just another five years on this earth. It’s easy to give into doom and gloom. Turn on CNN and you can easily believe the world’s going to hell in a handbasket. 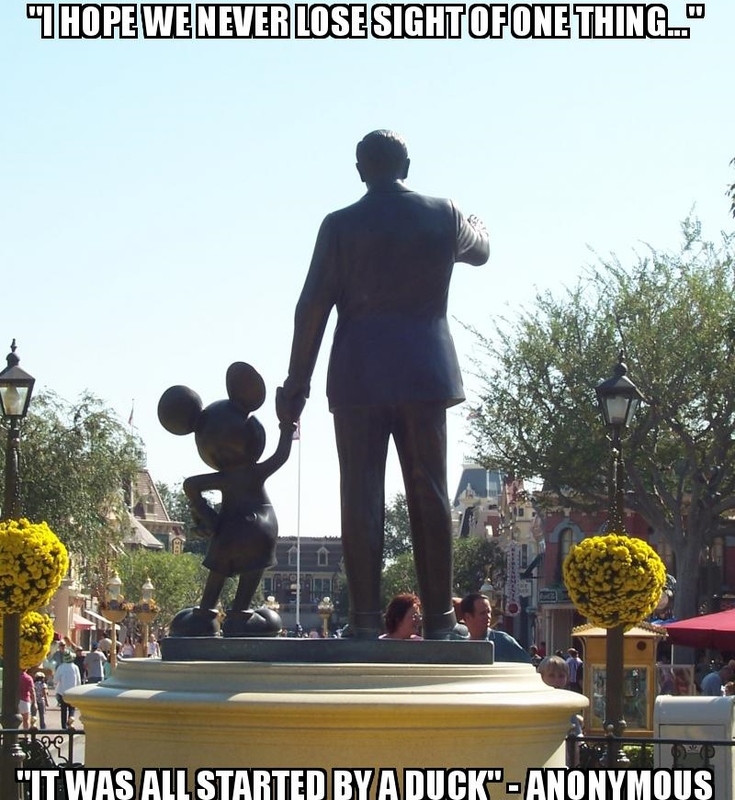 However, Walt never believed that way. He believed in innovation. How can technology and moving forward help society? Peoplemovers and Monorails…. they were more than just theme park rides to him. They were mass transportation units that would alleviate everyday stresses and congestion of individual commutes. The Carousel of Progress was not just a history of how far we’d come, but how much further we could go. These ideals of a better tomorrow were ideals Walt believed in, and one of the biggest reasons I admire the man. I know things aren’t that pleasant in the world right now. But I’d love to see how we could make things better if we worked together to help instead of hinder or stay complacent. I’d love to hear your thoughts on the matter, dear readers and fellow DisNerds? And be honest. Am I getting my hopes up on what’s really “just a movie?” Do you have hope for it like I do? Or, like me, do you hold out hope that somehow, we can build a REAL Tomorrowland if we can all manage to work together? If this article resonates with you, please comment, share with your friends, and start more conversations. Stay tuned for Part Three in the series, as I plan on sharing my thoughts on the movie itself shortly after it opens! 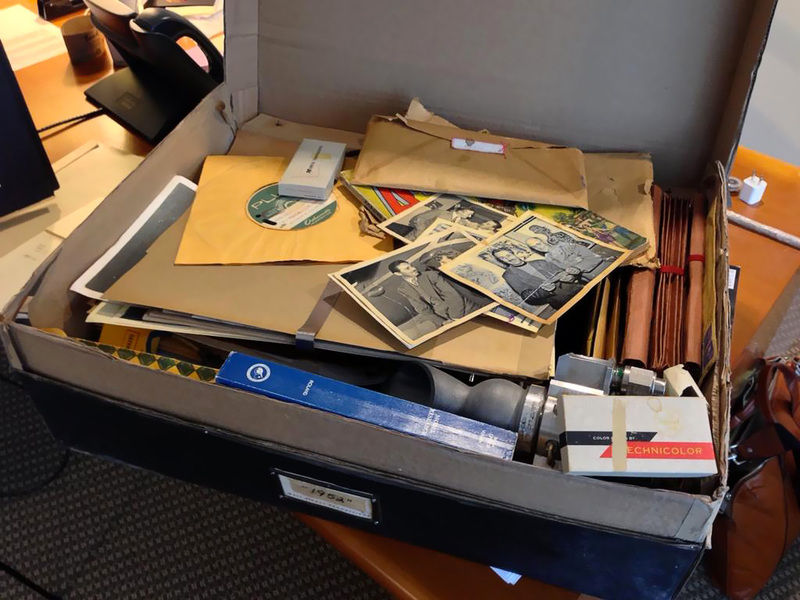 I hope we never lose sight of one thing: It was all started by a box. This movie was not going to be titled “1952.” This was Disney’s “Tomorrowland” movie finally seeing light, and being made by Brad Bird and Damon Lindelof. The public had been teased with the idea of a Tomorrowland movie before. After the success of Pirates of the Caribbean, many wondered how many attractions would get their own movie! At one point, I remember hearing wind of Tomorrowland being made into a sci-fi comedy, with Dwayne “The Rock” Johnson attached as a possible lead. This wasn’t the vision I had hoped for. This was more along the lines of the Eddie Murphy fronted “Haunted Mansion” – visually stunning, yet rather lackluster. Tomorrowland had more potential than that, I thought. Thankfully, we never got to see the full vision of that one played out, as Tomorrowland faded quietly into the background for a few years. Until the mystery box. What could it be? Like I stated above, I had my theories. What if Walt had planned on his small little park next to the studio, only to be intrigued so much by this vision for the future, that he realized he needed a bigger space? He needed an area where he could build different lands, including a Tomorrowland that had a secret portal into a real land of the future? The idea was staggering to me. The thing is, it was all a crazy theory cooked up in my mind. But also, should Disney go ahead with something even remotely like this, it was a bold move I could totally get behind. 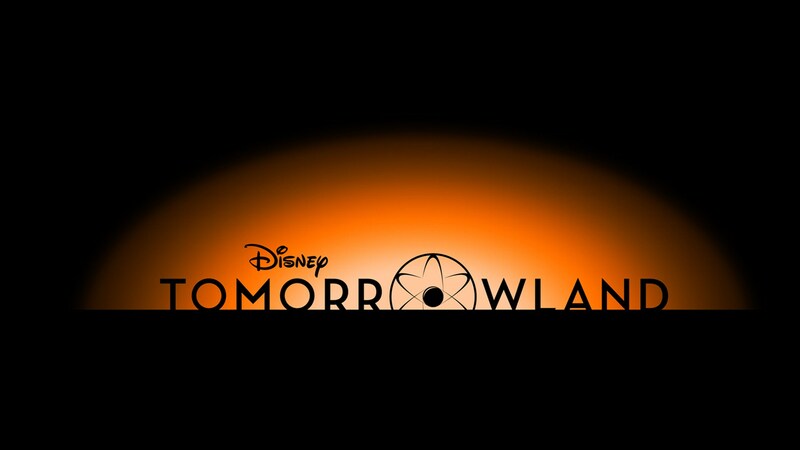 When Bird announced that he was indeed working on a Tomorrowland movie, I became giddy with excitement. I knew it! But still not known was, what would it be about? Of course, we now know enough to know my hypothesis wasn’t completely accurate. This movie isn’t about Walt Disney building Tomorrowland. But… we know that Tomorrowland is a real place in the movie, and that Walt had quite the hand in it. That right there is enough to keep me looking forward with a very real anticipation. To know that Disney, Bird, and Lindelof would dare to imagine this alternate reality storyline where Tomorrowland matters and is perhaps the most important place in the world is nothing short of mind blowing. However, while this explains my excitement for the upcoming movie, it still doesn’t explain WHY Tomorrowland matters so much. This is something I plan on doing my best to explain in part two of this three part series. Part two will be posted a few days from now, as I attempt to put into words why we need a place like Tomorrowland, and how this movie (I hope) can help us all realize that need. Part three will come after I’ve seen the movie (I don’t have media access to sneak previews, so unless I miraculously get an invitation to one, this will happen opening day), and am able to form thoughts on whether the movie succeeded in presenting this idea. I’d love to know your thoughts on the movie. Excited? Intrigued? Or just rather ambivalent towards the whole thing? I’d love to know why! Talk to you soon, fellow DisNerds! Happy April First, Everybody! Today, I thought we’d start the month off with some inspirational quotes. Let’s head into April with some motivation, shall we? A Running DisNerd, Part 1: I Don’t Run. But not for me. I’ve never been a runner. Okay, there was that one fifty-yard dash in fifth grade, where I managed to come in fifth place, and actually got a ribbon. However, my running days pretty much began and ended there. I’ll admit, I’m out of shape. I’ve been meaning to do something about that. But running has never been one of my preferred methods. Do I run? Maybe when chased, but that’s about it. 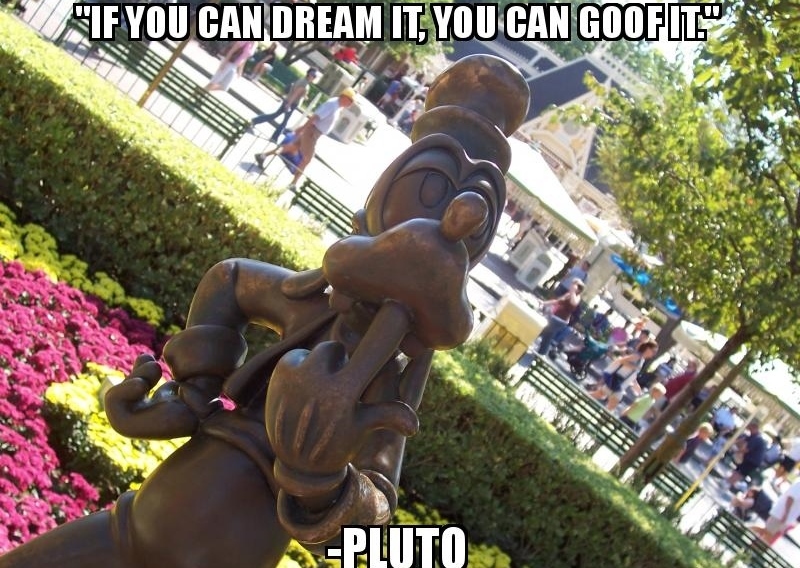 Therefore, is RunDisney for me? Had you asked me previously, I would tell you it was not in the cards. 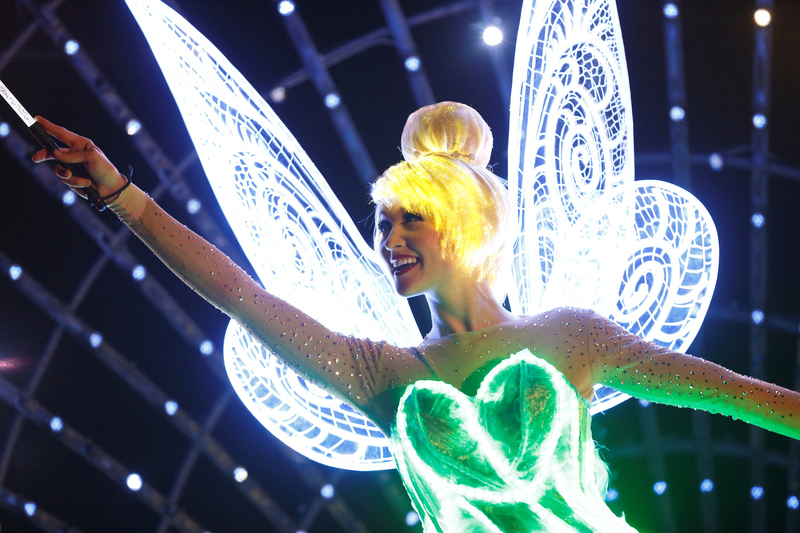 At least, this was the case up until last summer, when Mrs. DisNerd mentioned that registration was going to be opening up for the Tinker Bell Half-Marathon weekend in May 2015. 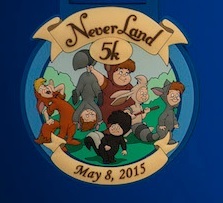 The event that specifically caught our attention was the Never Land 5k. If you’ve been reading Confessions for any amount of time, you know through posts such as “Still Living In Never Land” and “Real Character (Or, How Peter and Jake Made Wendy’s Day Perfectly Darling)” exactly how much Peter Pan and his Never Land family mean to us. With that being said, if there were a RunDisney event I was willing to participate in, the Never Land 5k would be the one.So, on that August morning, as registration opened, I registered our family to run in this event, with full intent of getting in shape for the run. I’m ashamed to admit, this hasn’t happened yet for yours truly, and I’m running out of time. A little more than a month out, and this DisNerd is nowhere near ready. I could blame injury (not the best knee in the world, a sprained ankle at one point), I could blame allergies and sickness, but in all honesty, what I blame most of all is me. Between everything else, there still should have been time to train and prep. It just hasn’t happen, and I can only point the finger at myself. With that realization out of the way, I feel there is still time to ready myself for a 5k without killing myself. I know I could walk at a brisk pace even. But this is RUNDisney, and now I have something to prove to myself. So begins a month and a half of training, to get into a decent running/jogging shape, and cross the finish line to earn my first 5k medal. Will winning this make me an honorary Lost Boy? I plan on posting an occasional update on my progress here, as well as sharing my overall experience with a RunDisney event. I’d like to ask you to join me on this journey. I’d also like to hear from you, fellow DisNerds. Any other RunDisney participants out there? I’d love to know your stories or experiences – maybe we can inspire each other! Can’t wait to share with you all at the finish line! 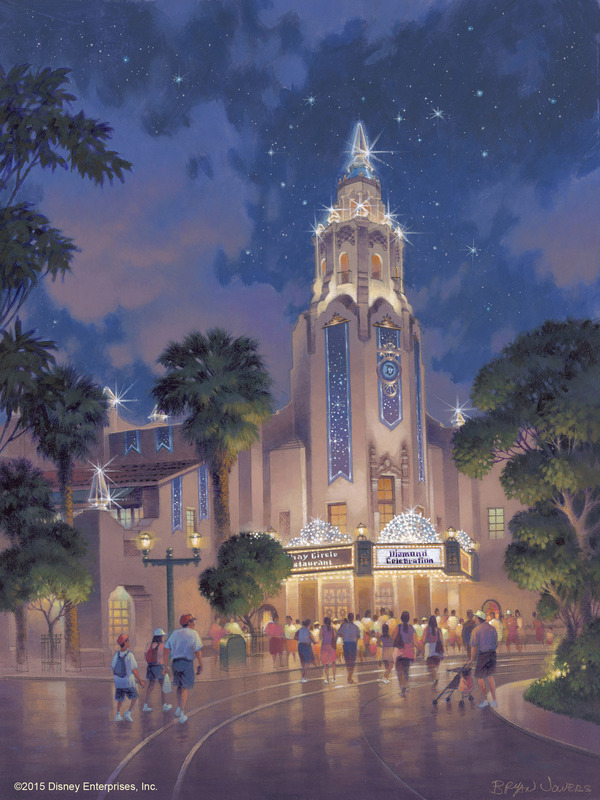 I’m sure like me, many of you were up last night glued to Twitter feeds or various Disney news sites, looking for updates on the media event and announcements for Disneyland’s upcoming Diamond Celebration for its 60th anniversary. As I scrolled through the Twitter feed searching for the latest news using #Disneyland60, I noticed a common theme amongst other users: excitement. Rumors had been swirling for months now, and after an event last year that revealed the Diamond Celebration logo, fans were hungry for more. When Tom Staggs took the stage and introduced Steve Davison, boy, did we ever get some exciting news! 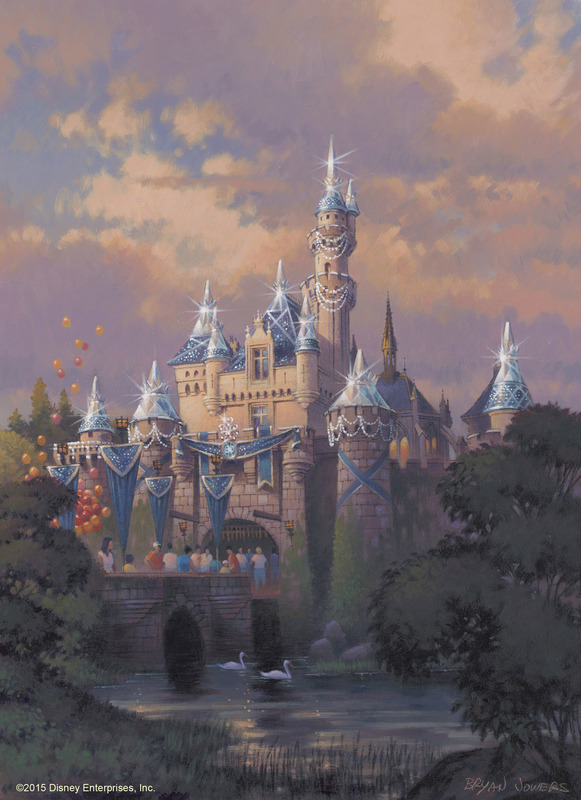 Both Sleeping Beauty Castle and Carthay Circle Theatre will be decked out with a diamond touch! 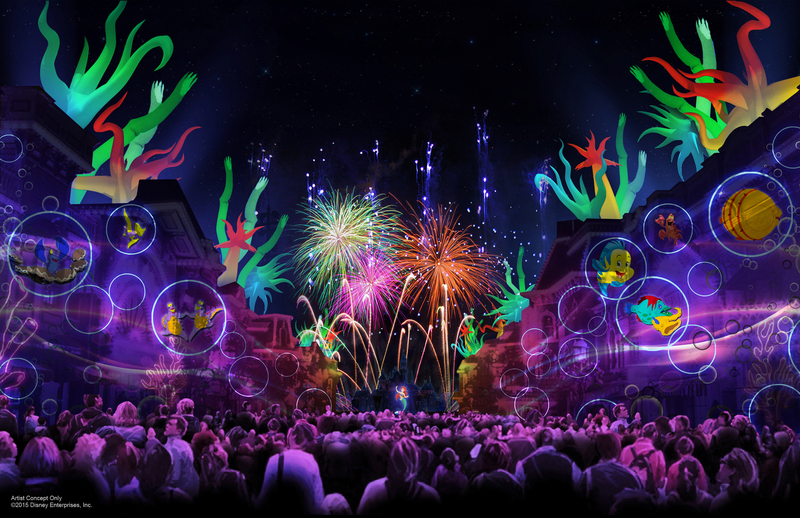 “Disneyland Forever” Concept Art. Picture copyright The Walt Disney Company. I have to say, this all looks amazing, and I can’t wait to see it in person. Add on the fact that “Disneyland Forever” will feature a brand new song – “Kiss Goodnight” – by legend and one of my Disney heroes Richard Sherman, and I am in DisNerd heaven! Why was this my favorite part? Glad you asked. I feel in this internet age of instant gratification, we sometimes feel as though we need to know everything, and know it as soon as we possibly can. We’re four months away from the 60th anniversary kickoff, and we find ourselves wanting to know what shows will be added, whether there will be any special promotions or merchandise, if there will be changes to rides with long refurbishments. I do get the fact that many of us will be planning our trips based on this information, and it’s good to know we definitely have new things to look forward to. Of course, one of Walt’s favorite words to use was “things,” and when he said it, it was more in reference to what cards he had yet to show. He would talk about Pirates of the Caribbean and say, “Of course there’ll be pirates and things…” Of course there would be pirates in a pirate attraction. But what other “things” was he talking about? Well, these were the “things” that made the attraction magical. The surprises around every corner. The amazing technology of audio animatronics. X Atencio’s rollicking “Yo Ho, a Pirate’s Life For Me.” Things that were meant to be experienced, not just talked and written about. If you ask me, we need more of these little “things,” surprises we’re not expecting. I know many of us (myself included) tend to search for and scour over every piece of news regarding changes at the parks as much as we can. But some things need to be seen with the eyes, to be heard with the ears, to be taken in from every angle that words on a website can’t describe. For a long time, it’s been rumored that the much elusive Hatbox Ghost will be making a return to the Haunted Mansion. We’ve begged Disney for an announcement on the matter. But how amazing would it be if it were to just be put back into the attraction without notice? 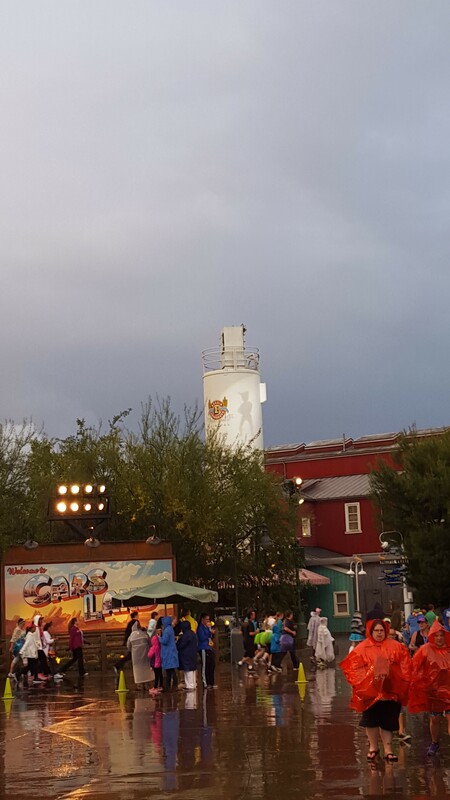 That a guest could be on the ride, and just… see him standing there, head in hatbox and all? “Did we just see…. ?” Imagine the surprise! I realize the word would spread fast, but what an awesome way to experience it! When it comes to the 60th, I’m glad to know plans are being made. I’m genuinely excited for what’s been announced. But what I’m most excited for is being able to be there and see things for myself. I want surprise when I step through the gates. I want to be wowed by something I haven’t read about. As my friend and fellow DisNerd Debi told me, it’s definitely a balancing act. “What is announced has to be big enough to draw the crowds (not a critique – Disneyland is an expensive park to run) while saving enough to keep us surprised, delighted and satisfied with our experience.” Disney, if you’re reading this, I’m sure I can speak for more than just myself when I say, we would be more than delighted for these surprises you have yet to reveal! How about you, fellow DisNerds? What are you looking most forward to? Do you want to be surprised by some “things” as well? Sound off below, and feel free to share! Visit Confessions of a DisNerd on Facebook! Other Fun Sites and Blogs!